Beautiful dolls, like the Empress below, are put on display for the Hina Matsuri (Girl’s Day Festival), which takes place on March 3. A set of dolls usually includes fifteen figures dressed like the members of the old Heian Court. They are typically displayed on a five step riser called a hina dan. Step 1 – has dairi-bina. These are the Emperor, holding a ritual baton and the Empress, holding a fan. Step 2 – has three court ladies, san-nin kanjo who are eager to serve tea. Step 3 – has five male musicians, the gonin bayashi. Each plays a musical instrument except the singer, who holds a fan. Step 4 – has the Udaijin (young adviser) and the Sadaijin (senior adviser). They are armed with bows and arrows. Step 5 – has three comical servants (Shicho) who wait on the Emperor. 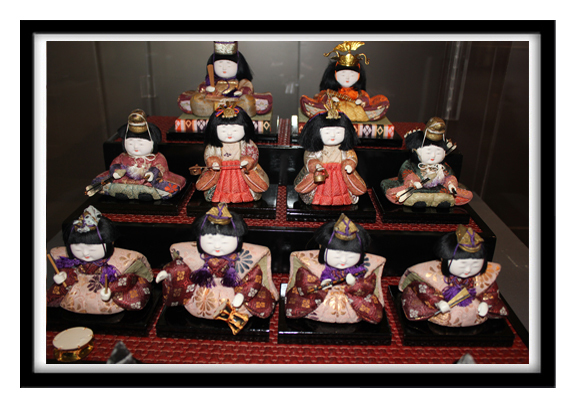 This is a group of thirteen kimekomi hina dolls. Kimekomi dolls are first carved out of wood. Next they are incised with form defining grooves. Then pieces of beautiful cloth are pressed into these grooves to create the doll’s costume.